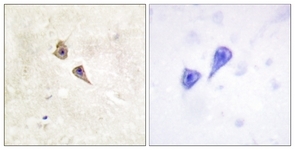 Immunohistochemistry (IHC) analyzes of IFN-α/βRα antibody (Cat.-No. : AP06615PU-N) in paraffin-embedded human brain tissue. 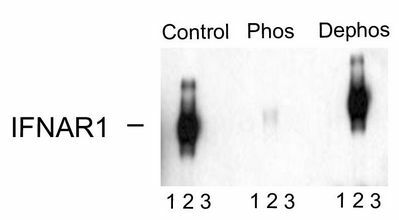 Western Blot analysis of IFNAR1 expression in transfected 293T cell line (H00003454-T02) by IFNAR1 MaxPab polyclonal antibody.Lane 1: IFNAR1 transfected lysate(63.50 KDa).Lane 2: Non-transfected lysate. Western blot of immunoprecipitates from HEK 293 cells transfected with 1. Mock, 2. IFNAR1 WT, and 3. IFNAR1 S535A and S539A mutants showing specific immunolabeling of the ~110k to ~130k IFNAR1 WT. 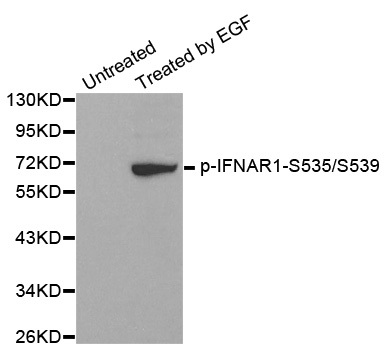 The immunolabeling is absent in IFNAR1 Ser535 and Ser539 mutants (Control). The immunolabeling is blocked by the phosphopeptide (Phos) used as the antigen but not by the corresponding dephosphopeptide (Dephos). Figure 1. 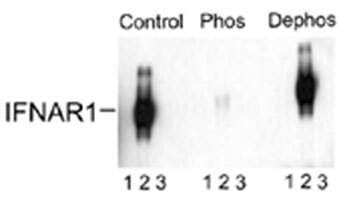 Western blot of immunoprecipitates from HEK 293 cells transfected with: 1. Mock, 2. IFNAR1 WT, and 3. IFNAR1 S535A and S539A mutants showing specific immunolabeling of the ~110k to ~130k IFNAR1 WT. The immunolabeling is absent in IFNAR1 Ser535 and Ser539 mutants (Control). The immunolabeling is blocked by the phosphopeptide (Phos) used as the antigen but not by the corresponding dephosphopeptide (Dephos). 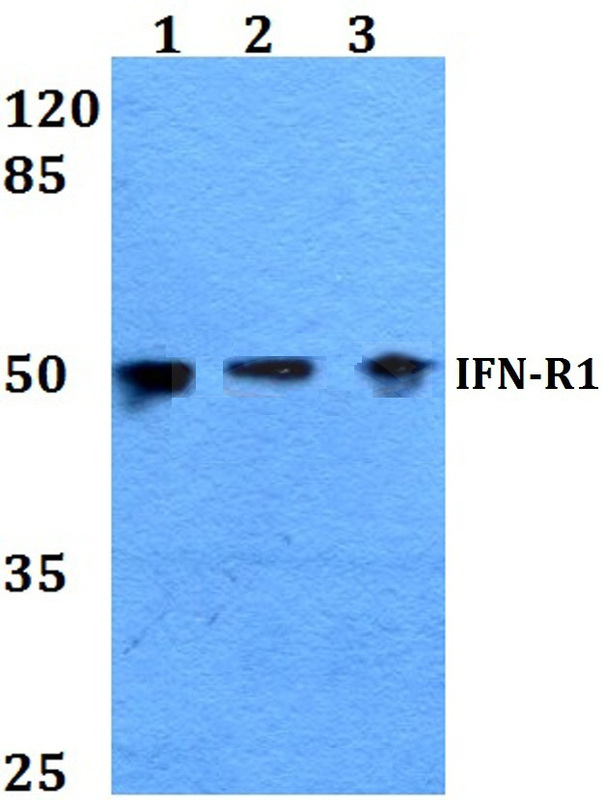 Western Blot analysis of IFNAR1 expression in transfected 293T cell line (H00003454-T01) by IFNAR1 MaxPab polyclonal antibody.Lane 1: IFNAR1 transfected lysate(61.27 KDa).Lane 2: Non-transfected lysate. 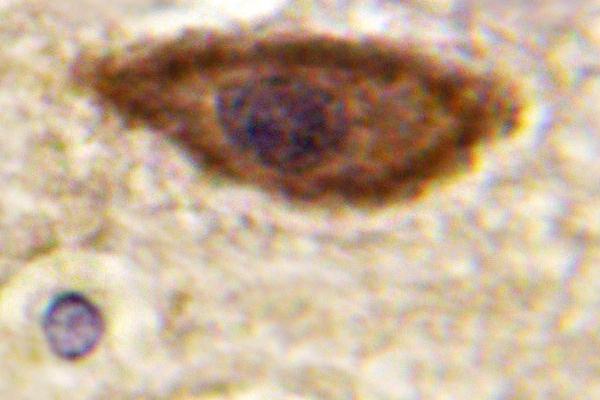 Immunohistochemistry analysis of paraffin-embedded human brain, using Interferon-alpha/beta Receptor alpha (Phospho-Tyr466) Antibody. The picture on the right is treated with the synthesized peptide. Immunohistochemistry analysis of paraffin-embedded human brain tissue, using Interferon-alpha/beta Receptor alpha chain (Ab-466) Antibody. The picture on the right is treated with the synthesized peptide. 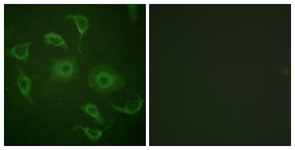 Immunofluorescence analysis of HepG2 cells, using Interferon-alpha/beta Receptor alpha chain (Ab-466) Antibody. The picture on the right is treated with the synthesized peptide. 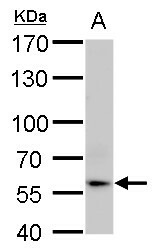 Staining of K562 lysate using IFNAR1 Antibody Cat.-No AP32812PU-N at 0.3 µg/ml (35µg protein in RIPA buffer). Primary incubation was 1 hour. Detected by chemiluminescence. 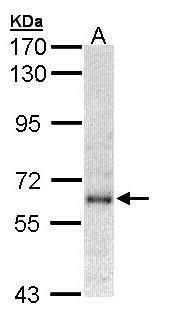 Staining of HepG2 lysate using IFNAR1 Antibody Cat.-No AP32813PU-N at 0.3 µg/ml (35µg protein in RIPA buffer). Primary incubation was 1 hour. Detected by chemiluminescence. 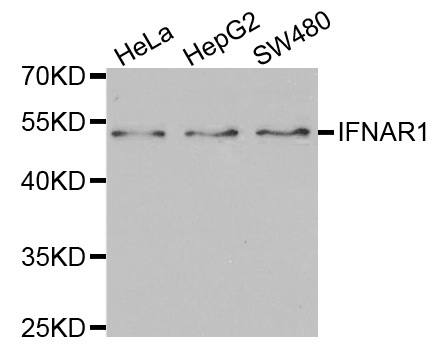 Western blot analysis of IFNAR1 (pY466) expression in K562 EGF-treated (A) whole cell lysates. Sample (30 ug of whole cell lysate). A: A431 . 7.5% SDS PAGE. TA308908 diluted at 1:1000. 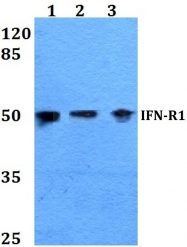 Western blot analysis of extracts of various cell lines, using IFNAR1 antibody. 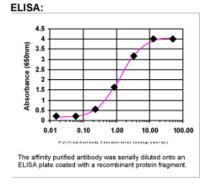 Western blot analysis of extracts from 293 cells, using phospho-IFNAR1-S535/S539 antibody.